Boris Johnson – The Mayor of London, is arguably perhaps the most democratically personally elected politician in the UK. As over 1.1 million London voters voted for him directly for the elected office of Mayor. This is compared to a UK Member of Parliament, who might win their seat with as little as 20,000 votes. In many seats, if you wore the right party badge a ‘mascot’ might get elected. Whilst the public are voting for a person, it is the party they represent that is being voted for. In my opinion, no other Conservative candidate could have won that election to become Mayor, at a time (May 2008) when the Labour Party were still very much in power in the UK. Boris Johnson won peoples votes despite him being a Conservative for many members of the public that voted for him. Thus, for a high profile Conservative like Boris to write glowingly about (arch sceptic) Piers Corbyn and criticise the Met Office, is in my opinion very significant politically in the UK. Especially in light of the fact that Boris wrote this before the Met Office started denying they had predicted mild winters and before their ‘secret’ prediction statement. Boris Johnson cares whether London (including Heathrow airport) and himself is made to look bad in the eyes of a world audience. I wonder what Boris thinks about the Met Office ‘secret’ prediction? As Boris is in the position of power, knowing whether or not London and Heathrow received the ‘secret’ warning’. As the UK government, Heathrow airport particularly, were woefully under-prepared AGAIN this winter, the big budget UK taxpayer-funded Met Office have finally moved from being a laughing-stock, into surely a public enquiry by that ‘secret’ statement. In the time of recession, big budget organisations like the Met Office have to be seen to be performing, not acting in the public’s eyes as a global warming campaigning lobby group. This time politicians have been publicly embarrassed by the Met Office. This issue will be he heard and will be discussed privately in the corridors of power. For one particular high profile politician like Boris Johnson to have moved publicly even as far as he goes in the following, demonstrates that the CAGW ‘political game has changed’ permanently in the UK. At the time Boris was fully behind the Labour Prime Minister, who went off to Copenhagen, stating ’50 Days to Save the Planet’, and spoke about ‘Flat-earthers’, ‘anti-science climate sceptics’. The Minister of State for the Department of Energy And Climate Change, ED Milliband (now the Labour Party leader, in opposition) apparently thinking calling CAGW sceptics ‘saboteurs’ was appropriate at the time all UK political parties were convinced that environmental ‘climate change’ policies were a vote winner, a UK General Election was possibly weeks, at most a few weeks away. This year, we have a new government in the UK after 13 years of AGW consensus, a Conservative/Liberal Democrat coalition, Boris is still mayor of London, and this week, he writes glowingly about Piers Corbyn (Weather Action) out predicting the Met Office. Piers is a total CAGW sceptic, behind the recent Climate Fools day – House of Commons meeting. For Boris Johnson to write publicly positively about Piers and criticizing the government-funded, Met Office, demonstrates how much things have changed. Boris Johnson, despite his slightly buffoonish comical genial image is nobody’s fool, serving prominently as a conservative politician for so long is evidence of that alone. “Piers Corbyn not only predicted the current weather, but he believes things are going to get much worse, says Boris Johnson. “….So let me seize this brief gap in the aerial bombardment to pose a question that is bugging me. Why did the Met Office forecast a “mild winter”? Boris Johnson went on to say that man-made co2 is still a cause of global warming, according to an overwhelming majority of scientists, James Delingpole of the Telegraph summaries Boris’ current dilemma more eloquently than I in his blog. “So what sounds like a fervent declaration of faith in the Warmist creed may on closer examination be a perfectly innocuous statement of the bleeding obvious cunningly calculated to appease all Boris’s rent-seeking chums in the City who stand to make a fortune from the Great Carbon Scam and would be most displeased if the Mayor of London were to show signs of wobbling. If the politicians think trouble is ahead, they back the winners, not only has the Met Office predictions of mild winter been wrong three winters in the row, they have been SEEN to be wrong, there was plenty of mainstream press coverage before the harsh winters that other forecaster were predicting a severe winter. Following the last years mild winter prediction by the Met Office, there was even BBC coverage debating whether their very expensive super computer had a ‘warm bias’ which was wildly reported in the mainstream media in the UK. Could the model, seemingly with an inability to predict colder seasons, have developed a warm bias, after such a long period of milder than average years? Experts I have spoken to tell me that this certainly is possible with such computer models. And if this is the case, what are the implications for the Hadley centre’s predictions for future global temperatures? Could they be affected by such a warm bias? If global temperatures were to fall in years to come would the computer model be capable of forecasting this? The Met Office (Hadley Centre) is an interconnected part of the UK Climate Science establishment. 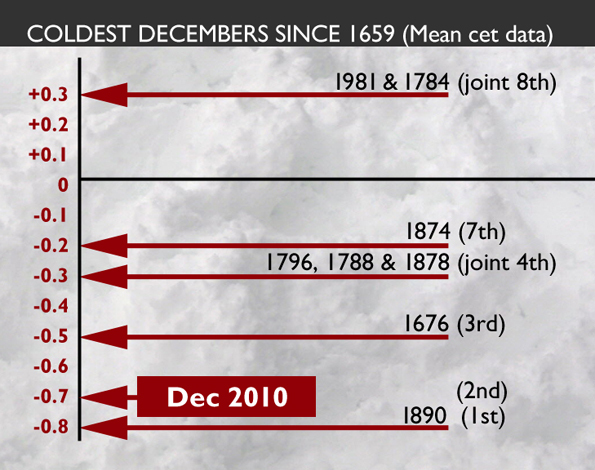 In the UK we have not just had a cold winter but the second coldest December on record, and the coldest winter on record. The UK CET record actually means something (not just a 30 year satellite record) the Central England Temperature (CET) dataset, goes back to the 1660′s. Again all this information, is now in the mainstream media with headlines including ‘mini ice age’ and ‘coldest winter in 300 years’ read by millions of members of the general public. 1.) If the Met office are telling the truth. Then the government failed to prepare or warn public bodies about what is now the SECOND coldest December in the UK since records began. London Heathrow was publicly embarrassed and closed for days as it could not handle a few inches of snow, it had only invested an additional £500,000 in de-icing equipment and the government apparently stepped into help ensure fresh supplies reached the airport. The lack of readiness for the snow will have had an effect on the UK economy. No doubt all this negative publicity shown by the media around the world, billions of pound in the economy and possibly risking future billions of foreign inwards investment, as London appears to be as organised as an undeveloped nation. I imagine some corporations, passengers, or airlines might want to sue. There is even, also some suspicion that if this was the case, it was kept quiet because predictions of the coldest winter in the UK for decades would be a bit awkward for the Energy and Climate Change Secretary of State flying off to the man-made global warming, climate change, global climate disruption, future climate breakdown Cop 15 Cancun conference. If the Met Office are shall we say, spinning a line, to make out they are not useless at predicting the weather, then I imagine even the dimmest politician and non-questioning ‘investigative’ journalists might start asking what exactly is the Met Office for. Bishop Hill and other blogs report that Freedom of Information request are being sent off for these ‘ so called ‘secret’ Met Office predictions made to the government. After all it must be true, the BBC’s Roger Harrabin reported it? I wonder if the BBC have thought to send any FOI requests in themselves, just to check the facts of this story. The BBC just renewed a 5 year contract with the Met Office to provide all the weather forecasting for the BBC. The BBC surely does not want to look as if it is being lax in its investigative journalism? If only to check that the service provided to the BBC by the Met Office is competent and can be trusted, as it is taxpayers money paying for this service. Harrabin is known as a friend of the Met so ‘leaking’ it via him is not a smart move. If 1) that the met office is telling the truth is the case then the met have put the government on the spot in terms of the lack of prep for the serious weather. That won’t make them popular in government circles at all. However it is a good excuse to sack Mr Huhne – well, here’s hoping. If 2) is the case, that they are not telling the truth or are being ‘economical’ with it, then they have just declared war on the government from a PR perspective and they will suffer the consequences. Either way its unlikely that they will get their Christmas wish of yet another new computer system costing millions of pounds from the taxpayer any time soon. Sir Humphrey does not take kindly to people acting ‘off message’. Good to see you at WUWT. Criticisms of your spelling etc. were unwarranted. An excellent post. No-one left in the UK to perform any sort of independent inquiry on anything. No doubt, the Met.Off. will claim that as they are part of the Defence Min. they are not required to respond to FOI requests on grounds of national security. Thank the Lord Chris Huhne is in charge of energy – nothing to worry about then. Even Charles Dodgson couldn’t make it up. Hacked? Stolen? Leaked? Purloined? Released? It really does not matter HOW they got into the public eye, just that the emails did. But I find it very strange that there is more outrage about “WHO” released the emails from CRU than the 250k documents Assange is throwing around the Internet. Boris isn’t the only one parsing carefully (‘most scientists believe …’). The Met Office claims to have warned in Nov of a ‘cold onset’ to the winter. That’s vuurrry vague; could mean a couple of weeks, a month or anything at all. Of course, since the whole winter will be cold, the “onset” figleaf may not be large enough to cover the business.